So much amazing is happening, and the Shootaround crew is here to help you keep track of it all. You’ll find takes on moments you might’ve missed from the previous night, along with ones you will remember forever. Andrew Sharp: It might not be fair to say that Steph Curry has been struggling in the Finals. He’s been decent. But he hasn’t been dominating. Ramona Shelburne wrote about it. I wrote about it. Everyone talked about it. Even when Golden State ran an exhausted Cavs team off the floor in Game 4, Curry still didn’t look quite right. In the fourth quarter of Game 5, during what at that point was another decent night from Curry, LeBron James came back from a crucial rest and quickly turned a six-point deficit into a tie game. A few minutes later, he pulled up from 10 feet behind the line and drained a 3 to give the Cavs the lead. Check out all of our postseason coverage! Then Curry showed up for real. First came that ice-cold step-back shot over Matthew Dellavedova to take back a two-point lead with 7:33 remaining. Then, on the next Warriors possession, Curry set a screen for Klay Thompson and the Cavs were terrified to leave Curry on the roll, allowing Thompson to drain an open 3. In seemingly a split second, the Cavs were down five again. As the quarter unfolded, LeBron battled back, but it was too late — Steph Curry had remembered he was Steph Curry. Curry hits the kind of shots that should make most defenses just want to give up. The opposing team’s offense tries to keep up with him, which leads to bad shots, which allows the Warriors to speed up the game … this is how Golden State has won all year. It’s also what this series deserves. I don’t want the Warriors to win just because Cleveland doesn’t have enough energy to finish these games. In the first four games, Golden State pushed LeBron to a level that we’d only ever dreamed about, but last night we remembered what it looks like when the Warriors have a superhero of their own. This series has been close, but if Steph continues to play like he did last night, it’s over. It was a statement 10 years in the making. 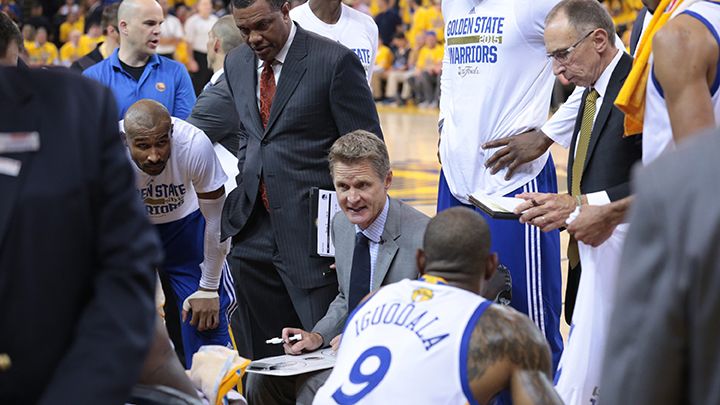 Kerr’s forceful lineup decisions in the past two games have lorded over the state of play. The Warriors have backed an undermanned opponent into a corner, forcing the Cavaliers to flail in an unbecoming manner. Now Golden State is one game away from winning it all. It’s a testament to all that Kerr has learned in the past decade, from both his successes and his failures as a consultant, analyst, general manager, and head coach. Because his relationship with small ball doesn’t start with the Warriors. Kerr and his associate head coach, Alvin Gentry, were there on the front lines of the revolution, when they served as front-office consultant and assistant coach, respectively, in Phoenix in the summer of 2004. But when he took the GM reins before the 2007-08 season, he found himself having a crisis of faith. Could the Suns win their way? For three seasons, for one reason or another, they couldn’t. And so Kerr broke, trading Shawn Marion to the Miami Heat for Shaq in one of the most depressing midseason deals in recent memory. Kerr was the man who killed Seven Seconds or Less with his bare hands. This season, he and Gentry inherited a team built like a master revision of those old Suns. The players, who’d spent years with Mark Jackson, just didn’t know it yet. This time, Kerr didn’t waver. He stayed true to a style and philosophy he’d helped cultivate all those years ago. And then he made it better. LeBron played point center last night, exactly what the Suns had begun calling Amare Stoudemire back when there was no apostrophe in his name, in the summer of 2005, before his season-ending knee injury. The present always seems to be underwhelming compared to what we were promised — but if those Suns had to sacrifice themselves to become an augury of what has become the present-day NBA, then I’d say we got everything we could’ve hoped for and more. What a basketball game. Fascinating series. Lebron carrying a load unfathomable. Steph…ridiculous. Maybe this is just me trying to neatly tie a bow on the 10-year anniversary of one of the most influential teams in recent NBA history.1 But as we approach Game 6, there is no longer a question of whether a team can win this way. It can, and more likely than not it will. This isn’t the start of a revolution, it’s the last phase of one. Welcome. 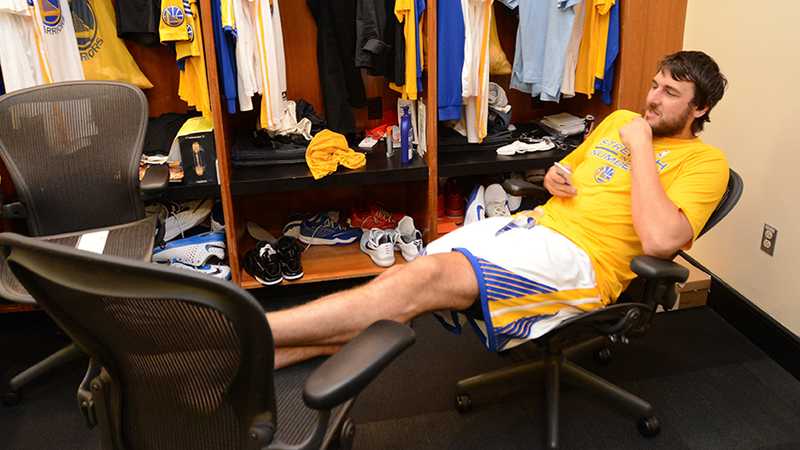 Seven months later, the Warriors are the favorites to win it all — as long as Bogut doesn’t play. After seeing only three minutes in Game 4, Golden State’s second-team All-Defense center didn’t leave the bench last night.2 While Bogut so recently looked like the ideal center for the NBA of 2015 — a slip-passing anchor that the Warriors’ spread offense could whir around, a rim-protecting goon whose movement around the paint was the Bay Area’s best ballet — it seems like he’s now watching himself go extinct. After Game 5, Kerr said, “It’s not a series for bigs right now,” but I wonder if he’s going far enough. With neither team playing a dude over 6-foot-9 for the majority of the Warriors’ win, it’s hard not to look a couple of years into the future and imagine a league in which the best teams are all running out lineups of five 6-foot-7 Swiss Army knives who can play every position at once. If November feels like it was part of another era, it might be because it already is. Chris Ryan: This is the NBA Finals of “despite.” The Cavs are still in this thing despite not having two of their three best players. The Warriors are leading the series despite LeBron James averaging nearly a triple-double. James is still standing despite playing 45.6 minutes a game. And last night, he put in one of the greatest individual performances I have ever seen from a basketball player — screw that, from an athlete — despite that performance coming in a defeat. With 3:40 left in the first quarter, the Cavs were down 16-11 when David Blatt replaced Tristan Thompson with James Jones. This meant LeBron James was playing center. What do you call that? Point 5? Center guard? An octopus god made of Mike D’Antoni’s fever dreams? LeBron would score five and hand out two assists in the closing minutes of the quarter, and Cleveland would finish the frame tied with Golden State at 22. 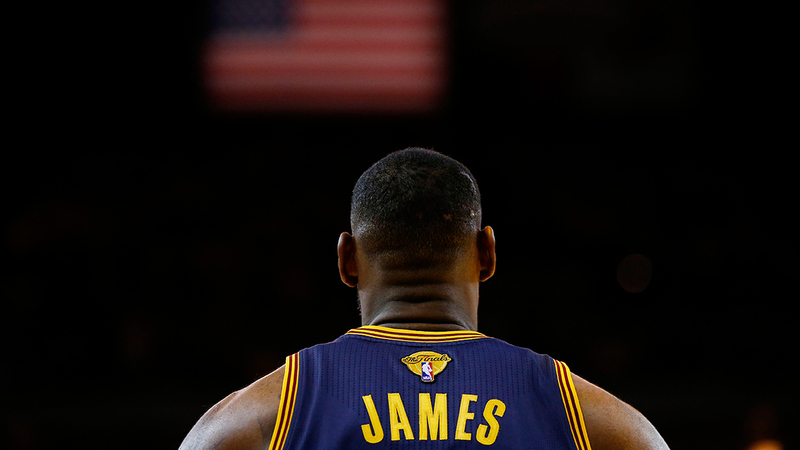 Mark Jackson compared LeBron’s performance to Magic Johnson’s legendary game at center in the 1980 Finals. Jeff Van Gundy was not having it. Magic’s center game came during his rookie season and won the Lakers a title. But I will say this: 2015 Finals LeBron deserves to be mentioned in the same breath. Despite the fact that the Cavs are probably going to lose the series. Robert Mays: Before I get into how much it warmed my soul to see a salt-and-pepper Kirk Hammett wail away at “The Star-Spangled Banner,” a quick lesson in Metallica history: In late 1982, forced north by an ultimatum from a new bassist they were courting, a group of L.A. metal heads settled into a house at 3132 Carlson Boulevard in El Cerrito, less than 15 miles from Oracle Arena. There, they finished their first album — and eventually two more. In less than a decade, they’d become the biggest band in the world. That house still stands, just minus the garage where some of the best metal ever was born. The Bay Area is inextricable from Metallica lore,3 which made seeing Hammett and James Hetfield in Warriors T-shirts on national TV seem right. Their rendition was simple and straightforward. 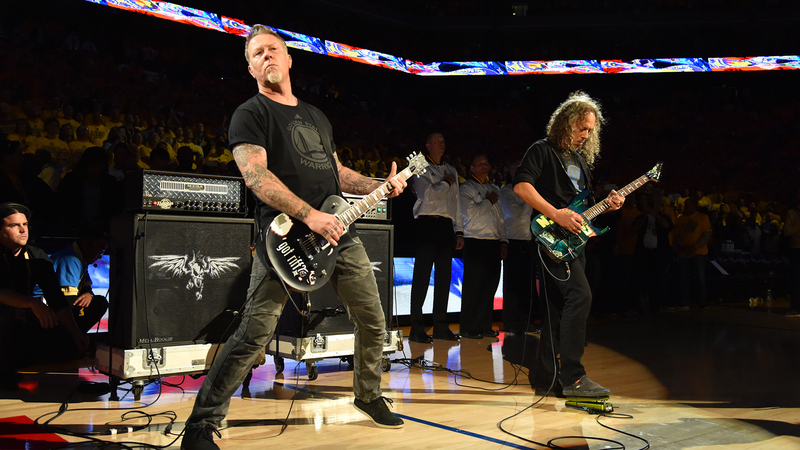 No, it wasn’t the “Battery” solo, but there was still something pretty damn cool about seeing a pair of local rock gods shred away before the Bay’s biggest basketball moment in 40 years. For me, Hetfield hammering down on those strings might as well be the flaming guitar player from Mad Max. But the best part of last night was realizing that I wasn’t alone. 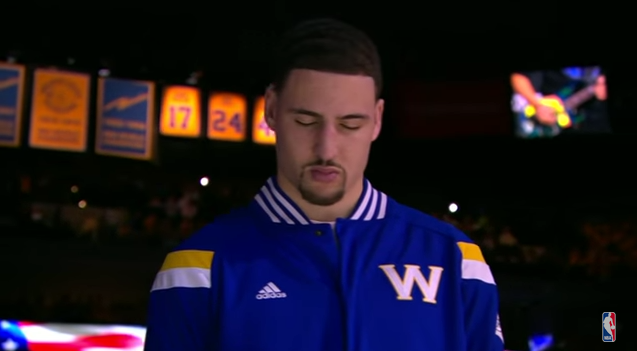 Klay Thompson is clearly a guy who’s listened to “Fade to Black” in his bedroom on repeat, more than once. Hua Hsu: One of the strange byproducts of the playoffs is having your dreams and desires rewired by seeing the same commercials over and over. By mid-June, I will know some of these commercials better than I know “Juicy.” I’ve begun to recognize the necessity of having a touch-enabled sidebar on the edge of my mobile phone. I’ve come to accept that “By Waka Flocka ft. Good Charlotte” is a thing. I feel good about Harrison Barnes’s brand, although it’s troubling that GMC never bothers to identify him. But my favorite is that one in which Perry Farrell goes, “There’s nothing worse than feeling like a coward.” While I don’t completely understand what he means, it’s something I’ve thought about a lot while watching the Cavs gut their way through a series the Warriors were supposed to win with ease. LeBron was absolutely unreal in Game 5 — posting up, distributing, going shot-for-shot with Steph, hitting those one-legged Dirk fadeaways, all while looking slightly depressed. Nobody has ever had the power to feel so inevitable. But I’m most in awe of LeBron’s ability to coax these unlikely moments of bravery out of his teammates — to erase any latent feelings of cowardice that might be knocking around in the minds of these cast-offs, old guys, and ex-Knicks. Delly, Mozgov, or Thompson will do something wildly unprecedented and then, just as they’re peaking, they’ll turn to LeBron and he’ll guide them somewhere even higher. He’s so cosmically unfazed, so comfortable in this moment that has reduced everyone else on both teams to sometimes-amazing, mostly erratic versions of their usual selves. I wonder what it must be like to stand so close to fire. Looking back, it’s incredible how ahead of the curve the Suns were in 2005. Phoenix led all 3-point-shooting categories while playing at the fastest pace in the league. Sixty percent of the Suns’ field goal attempts in the regular season came from either 3-point range or right at the rim; 62 percent of the Warriors’ attempts came from those zones this season. Well, other than to keep Draymond Green from getting T’d up. Lore with which I’m embarrassingly familiar, if that wasn’t clear.